Hi everyone. Today I'm sharing a Christmas card that I made for a couple of challenges. I LOVE this beautiful Penny Black stamp called Red Star. Not only does it have the beautiful poinsettia, but it also comes with the sentiment. I used my SU! markers to colour onto my stamp, misted with a bit of water, and then stamped onto mixed media paper. Because this paper doesn't absorb as quickly as watercolour paper, it gave me lots of time to use a water brush to move some of the ink around. I inked my sentiment stamp and then used my water brush to just touch it likely in a few places before stamping. I was hoping it would give it a bit of a watercolour look to match the image ... and I think it worked. I'm happy with how it came out. 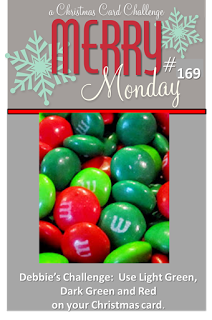 I'm entering this into Merry Monday Challenge #169 - use light green, dark green and red. And I'm entering this into ATS&M #158 - Holidays. Thanks for coming by for a visit ... and welcome to my new followers! Glad you could join me! Just stunning, Loll! Love the organic feel of this beauty! This is so pretty, Loll! 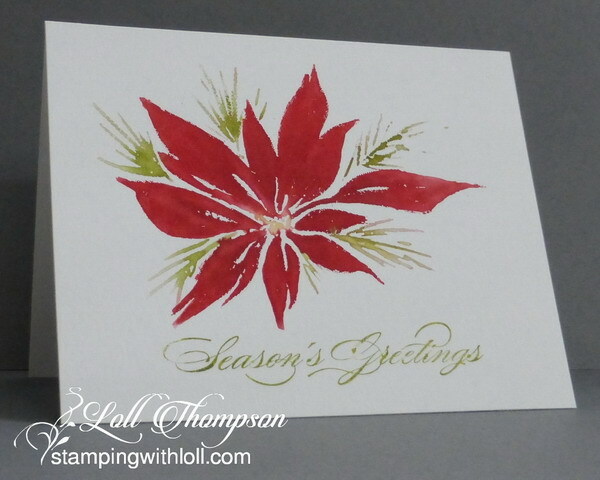 I love this poinsettia and the sentiment is so elegant and a perfect pairing! Thanks for sharing this with us at Merry Monday! You definitely achieved a great watercolour look, even on the sentiment! I don't know that PB stamp (might have to give it a try when I see you!). Perfect card for the Merry Monday challenge! This is a truly beautiful card. And yes, even the sentiment looks like watercolor. Your coloring is awesome. Thanks so much for sharing it. Having the sentiment included in the set is indeed a great bonus, Loll, especially when it is such a fancy font. It's perfect with it's little touch of water added, as is the lovely poinsettia. What a fab card Loll, love that stamp too. This is a great watercolour look too even down to the sentiment. A fabulous card and I love your colouring technique. Loll, the water color feel along with the scripty sentiment make for a very lovely holiday card. Perfect card for mailing. Thanks for playing at Merry Monday. What a gorgeous stamp, and I love the effect you've achieved with water. A fab image and sentiment, perfect CAS card. Well, you certainly nailed this one. Love the way you laid this out with that amazing stamp. This looks as though it wouldn't be difficult to mass produce. Although, have to say, never mass produced a card, yet. This is really gorgeous, Loll! I love how you added a touch of water to the bloom and sentiment to give them a water colored effect! And, that you kept your design CAS, too! Thanks so much for playing along with us this week at ATSM! Definitely has a watercolor feel and is totally lovely, Loll! Such a beautiful card, Loll and a gorgeous image! The watercolored look is so soft and pretty. Thanks so much for joining us at Merry Monday. Beautiful! So very elegant & beautifully coloured.